When I was sent this yesterday I thought it must be a fake or a joke. It’s certainly not the latter. 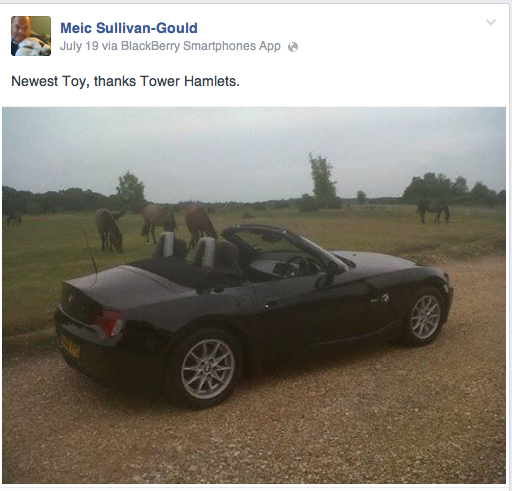 It’s the latest attempt at comedy from Tower Hamlets council’s in-house joker, the Interim Monitoring Officer Meic Sullivan-Gould. He likes Facebook, does our Meic, and he seems a happy-go-lucky sort of guy. And at least he has good taste in international rugby teams (Wales). But I’m not sure how well his latest offerings on social media (during the Panorama programme in March, he attacked the Mayor’s critics) will go down with the hard-pressed taxpayers of Tower Hamlets. Or his colleagues, or Mayor Lutfur Rahman and his team, come to think of it. I’m not sure what rate he’s being paid as a contractor at Tower Hamlets council but his predecessor, Isabella Freeman, took a salary of £121,000. I suspect Meic would consider himself worth far more than that. He’s lucky to be in a position where he can afford a new car, even if it is a crappy BMW Z4 (08 reg, worth about £10k). The vast majority of people who pay his wages (or, according to Meic, who paid for his car) can only dream of buying one. According to Tower Hamlets Food Bank, 70 per cent of all households in the borough survive on an annual income of less than £20,000. So although I’m sure he meant no harm with his little jest (and he probably had a little bet it’d be reported – I’m told his toy is in the town hall car park today), it is a little crass. Incidentally, he also wrote this on Facebook after last month’s Tower Hamlets council meeting, when I was ejected.